Successfully Added OBDII Car Running Diagnostic Data Recorder to your Shopping Cart. It doesn't get any easier than this! This is a simple and powerful car data recorder which only needs to be plugged into your car's OBDII slot, that's it! Drive and record a mountain of performance details about your car that you could previously only get from a mechanic. So how does the CVJH-A23 OBDII Car Running Diagnostic Data Recorder work? This newly available product works with one simple step, you insert it into your cars OBDII slot (which is normally located beneath the dash board or below your car's steering wheel). After going for a quick drive around the block or after a normal weeks travels you simply unplug the card reader and connected to your computer via the USB slot to view all the recorded data with the included windows software application. The CVJH-A23 has enough internal memory to record up to 240 hours of vehicle data. This kind of "magic tool" has never been readily available to DIY consumers before. In the past you would have had to go to an expensive mechanic just to get a simple computer check-up for your car, but not anymore! The best part is, you do not need any special tools or automotive expertise to use this OBDII Car Running Diagnostic Data Recorder. After its installed, the CVJH-A23 does all the work for you. It continuously reads and stores data from your car's on-board computers, logging driving and engine performance, just like a "black box". When you want to see the results, simply pull it out and plug it into your computer, simple as that! This is the perfect car tool for hobbyists, auto enthusiasts, businesses with one or more vehicles, parents of teenagers and pretty much all drivers who want to be able to do tasks like monitoring engine performance or prove their speed if in a collision. The CVJH-A23 is carefully designed and tested to comply with OBDII protocols, which are used on most 1996 and newer cars and light trucks. If you enjoy DIY car maintenance, or know someone else who does, then you simply cannot pass up purchasing this one of a kind tool for checking vehicle performance. This is in stock right now, place your order today and we will ship it out tomorrow! 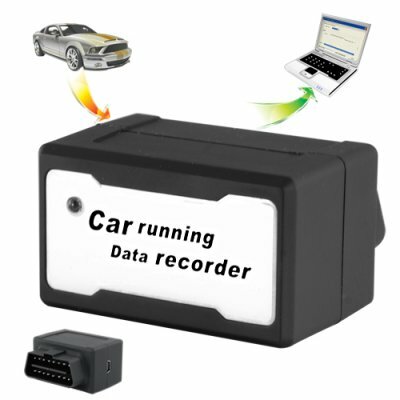 IMPORTANT NOTE 1: As the wholesaler, we provide the package containing the CVJH-A23 car data recorder and software. Chinavasion provides no warranty or customer support regarding the software. We cannot give advice regarding the software or tell you if your model car is compatible with this particular product. If you have questions regarding the use of the Car Data Recorder we suggest you search for internet forums related to car maintenance. IMPORTANT NOTE 2: The CVJH-A23 works on vehicles that's are OBDII/EOBD compliant. The best way check if your car has an OBDII slot is to check the car user manual, contact your car dealer or talk to your favorite mechanic. USAGE NOTE: Make sure your car is completely switched off and the BLUE LED light has turned off before unplugging the car running data recorder. This sound to good to be true, what happens if it has been recording for more than the stated 240 hours? Can connect it to my car and still have the card reader connected to my laptop? This is highly unadvisable as it could cause errors and provide false reading. It could also cause damage to your laptop. When is it safe to unplug the data recorder from my car? First, make sure you switch of your vehicle, and wait for the BLUE LED light to turn off before unplugging the card reader while the BLUE led is still on will corrupt the data files recorded and provide false information.